You probably know by now that I'm a massive Charlotte Tilbury fan and own half of her products, so I was obviously looking forward to her latest launch called Hot Lips! 12 new lipsticks in a mix of the K.I.S.S.I.N.G and the Matte Revolution formulas, inspired by various celebrities, with £1 from the sale of each lipstick going to charity. It truly is a fab collection. I've been buying quite a few bits from Cult Beauty over the last few weeks so I thought I'd do a little haul post to show you what I've been buying. The first set of purchases was definitely influenced by the goody bag that was available for spending £110 or more on the website, which is easily done when you have an ever-growing wishlist! I love these goody bags as they are always worth quite a bit of money and you get the chance to try loads of different products that you wouldn't necessarily have thought to buy. Something I really used to struggle with, until very recently, is making my eyeshadow last all day. Even a few hours was a struggle. Eyeshadow creases really badly on me and it wears off so fast, I'm always left with a small strip of colour just above my lashes and the rest just disappears. Well, things have changed and I can actually make my eyeshadow stay on perfectly all day! It takes a little bit of prep but it's honestly so worth it. This is a three step process. Powder the eyelids. I use the Charlotte Tilbury Airbrush Flawless Finish Skin Perfecting Powder (£33 at Selfridges) in Fair as it is extremely finely milled and smooths out the skin, as well as removing excess oil. Use an eyeshadow primer. My favourite is the NARS Smudge Proof Eyeshadow Base (£19.50 at SpaceNK) as it's a creamy primer that blends out to a colour-less finish that is very smooth. Apply a cream eyeshadow base. I use the MAC Pro Longwear Paint Pot in Painterly (£16 at MAC) as it's a good match for my skin tone and it dries down fast after application. It's time to apply your eyeshadow! All three of these products separately help to extend the wear of my eyeshadow compared to other products I've tried in the past but all three together are the most amazing combination for making my eyeshadow stay on all day. Even when I've been to the gym! If you suffer with oily eyelids and can't keep eyeshadow on for more than a few hours, you should give these steps a go, it will be worth it! Before rushing out and buying these exact products, you should definitely give it a go with whatever similar products you have already as I'm sure you can find your own amazing combo that works for you! How do you make your eyeshadow last all day? Are you going to give this a go? I'm a sucker for really sweet scents. Anything that smells like sweets, cake or chocolate is a winner in my eyes (or maybe I should say nose...)! Imperial Leather kindly sent me some of their products from the Sweets range and I've been enjoying trying them out. My favourite product has to be the Foamy Banana Shower Cream*. I basically love the sweet smell and taste of artificial banana things. Like milkshake, banana sweets, banana ice cream etc. It's all amazing. This is like the bottled version of the foam banana sweets we all enjoyed as children (and probably adults too!). It's so sweet and creamy. I really enjoy using this in the shower. It's also softening on the skin too. The other shower cream I was sent, is the Comforting Marshmallow Shower Cream*. This is also deliciously scented. This one is more of a vanilla kind of scent, if you prefer something more subtle but still sweet and creamy at the same time. Continuing on with the marshmallow scent, there is the Marshmallow Bath Cream* which is fab if you prefer baths to showers. It creates a good amount of bubbles and it adds a soft scent to the water that lingers on the skin afterwards. It makes for a very girly, pampering bath when you use this and it's softening on the skin, just like the shower creams. I would definitely recommend trying these, especially since they are so well priced at around £1 for shower creams and £1.99 for bath creams. They are available in all the usual places like Boots, Superdrug and all the main supermarkets so you shouldn't have any trouble getting hold of these. Have you tried any of these? I also like the look of the Fruit Chew, Sherbet Lemon and Spearmint scents! 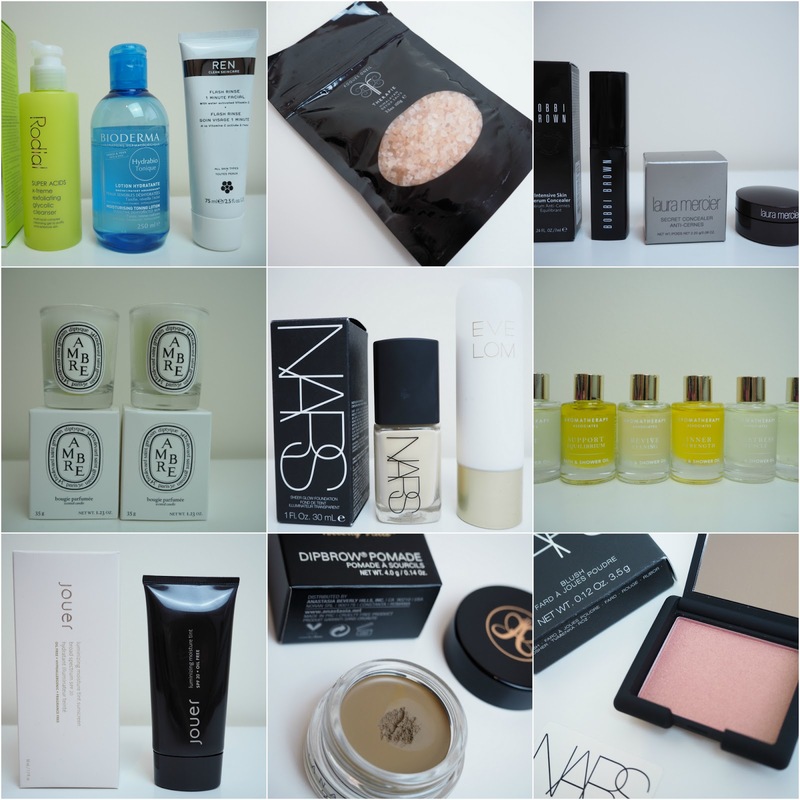 I haven't blogged about my empty products for ages now but I seemed to be starting a little collection of used products. Rather than let them build up into an overwhelming pile of stuff that ultimately just ends up being thrown out without any mention on the blog, I thought I'd let you know my thoughts on them. I'll try and make this a regular feature on the blog if you fancy it! I tried the Sunday Riley Blue Moon Tranquility Cleansing Balm (£46 at SpaceNK) for the first time and I did think it was a nice cleanser. It left my skin hydrated, just how I like but I wouldn't necessarily say it's worth £46 really. It almost feels slightly exfoliating on the skin as it's not a completely smooth balm but I didn't notice any amazing effects from this. Some people say that this smells like chocolate orange but I didn't get that at all. I don't think it's a horrible scent but it's not the best. There's no point in filling a product with unnecessary artificial scents for the sake of it though so really not bothered about the scent aspect, just thought I'd mention it! I definitely prefer the Oskia Perfect Cleanser (£32.50 at SpaceNK) to this. I've just recently purchased my third tube! I was back on to Bioderma Micellar Water (£10.50 at Boots) after buying some in France last year and falling in love with the stuff. A while back I wasn't sure if I thought it was that great or not but this time around I definitely know it's good. I totally notice the difference when I run out of it and start using a cheaper version like the Garnier one. I will definitely repurchase this again at some point but for now I've just bought the Clarins Water Comfort One-Step Cleanser (£21 at Boots) after having it used on me yesterday as part of an amazing mini facial at Fenwick Newcastle. Continuing on with the skincare, I was using the Charlotte Tilbury Magic Eye Rescue (£40 at John Lewis) and can honestly say it is one of the best, if not the best eye cream I've ever used. It has a cream-gel consistency so it doesn't feel too heavy but it is super nourishing. It honestly provides the most long lasting hydration I've ever experienced with an eye cream. Makeup applies so nicely over the top of this too. I'll definitely get some more of this in the future but I'm always trying new things as that's all part of the fun for me! I've recently been using the Clarins Eye Contour Balm (£31 at John Lewis) but also got given a sample of the Eye Contour Gel (£31 at John Lewis). I actually like the gel version so much better which I didn't expect at all. I love really hydrating products on the eye area and assumed the gel would be too light but it really does work for me. It feels cooling and refreshing on application but it still provides the hit of moisture my eye area needs. It's great under makeup too. I really recommend that you get a sample of this as it's fab. I got the L'Occitane Almond Shower Oil (£18 at Debenhams) in a gift set in the Boxing Day Sales and I really stretched this out as I didn't want it to ever run out! This product is so luxurious and smells amazing. I do love it as a shower oil but what I enjoy most, is using this as a shaving oil. It makes the whole experience so much nicer and gives a very smooth result. My legs got extremely dry over the Winter/Spring and every time I used this, they were instantly better! I really want some more of this but I've just been putting it off as it's quite expensive to use as a shaving oil. I believe it's worth it though! Bumble & Bumble Hairdresser's Invisible Oil Heat/UV Protective Primer (£20.50 at Look Fantastic). Wow that's a long name! I rediscovered this sample that I'd left in my suitcase from my honeymoon last year and have loved using this product again. I've had the full size in the past and I really do rate it. It's a spray in heat protector that you use on wet hair prior to blow drying and this leaves my hair soft and I can feel confident that it's protecting my hair. It doesn't overload the hair with product or make it greasy. When it comes to Laura Geller makeup, whilst it's now easier to get hold of in the UK, I bet most people only really know about her baked foundation or her gelato highlighters, which look amazing by the way! I bought a Today's Special Value set from QVC before Christmas last year and I found a fab mascara that I wouldn't have otherwise tried! It's the Laura Geller StyleLash Intense Lengthening Mascara (£19 at Debenhams). This stuff is incredible at lengthening the lashes and giving a separated look. I hate the clumpy look so this is ideal for me! It's perfect for daytime use and I found that it was very long lasting, didn't smudge or flake and was easily removed at the end of the day. I think I prefer something a little more volumising for nights out/special occasions but this is definitely one to try if you want super long lashes! I hope you found these mini reviews helpful. I'm now going to feel extremely satisfied as I dispose of these empty products, knowing I put them to good use for once! Have you used up any products recently that you just have to repurchase or maybe something that was rather disappointing? Some of the high end Summer 2016 collections hit the beauty counters a few weeks ago and I ended up making a few purchases. I thought you might like to see what I picked up as I think these products look stunning! I haven't actually tried any of them yet though. What is it with me buying things and being scared to use them?!! I'll start with the most amazing purchase of all, which I was super excited to see on counter as I saw it on a blog about a month ago and really liked the look of it. It's the Chanel Empreinte de Dèsert eyeshadow quad (£42 at Harrods). The gold, bronze and green shades are so beautiful and I think they will complement my green eyes nicely. I also decided to go for some of the Chanel Lèvres Scintillantes lipglosses (£22 at Harrods) as I loved some of the shades. I chose Tanami, a bright coral pink shade, and Sahara, a stunning orange-peach shade packed with golden shimmer. The Estée Lauder Bronze Goddess fragrance is one of my favourites. The delicious coconut based scent is just Summer in a bottle. One of the new launches from the Estée Lauder Bronze Goddess range this year is the Shimmering Body Oil Spray (£30 at Debenhams). I've been after something like this for a while now and whilst these types of oils are typically gold, this rose gold one really appealed to me so I snapped it straight up. Not only does it look extremely pretty, it also has the Bronze Goddess scent! Yum! Whilst browsing the Bronze Goddess range, I found the Pure Color Lip and Cheek Summer Glow (£24.50 at Debenhams) which I thought looked really nice for going away on holiday. There were stunning coral and hot pink versions but I chose the gold option called Sunburst. I think this will be perfect for a creamy highlight and some lovely sheer golden shimmery lips on a night out. 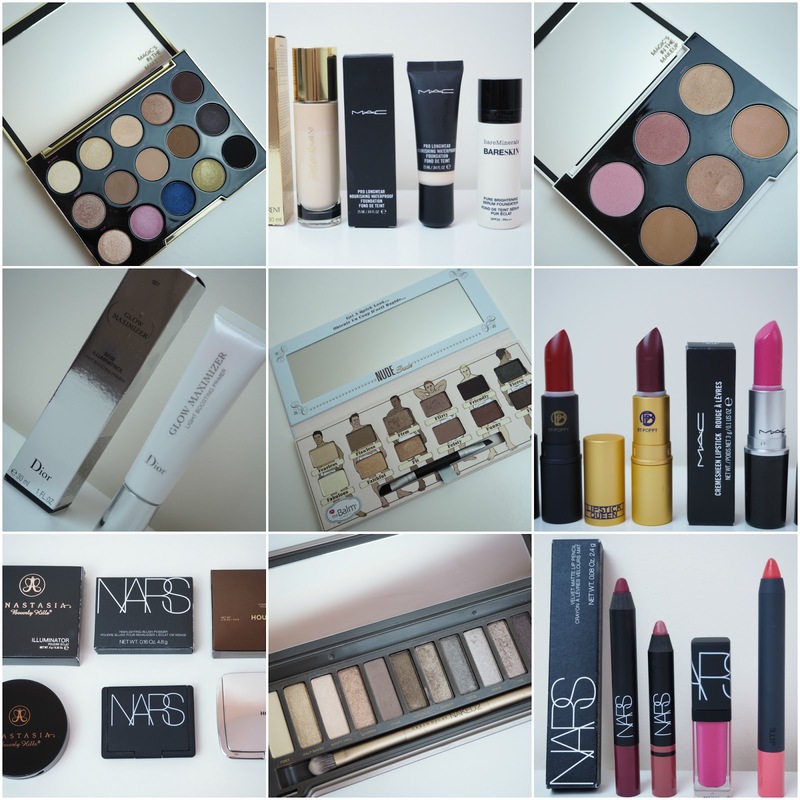 Hope you enjoyed seeing some of my purchases from the latest beauty launches. There have been many other purchases but I would be on for days talking about those and thought I better mention the limited edition stuff whilst it's still available to buy! Have you bought anything from the Summer beauty launches this year?